The soul of a digital camera is its sensor—to determine image size, resolution, low-light performance, depth of field, dynamic range, lenses, and even the camera’s physical size, the sensor is key. An image sensor is a solid-state device, the part of the camera’s hardware that captures light and converts what you see through a viewfinder or LCD monitor into an image. Think of the sensor as the electronic equivalent of film. With film cameras, you could choose from hundreds of film brands, each with its own unique and identifiable characteristics. With digital cameras, much of that technology is built into the hardware, and you can apply special filmlike effects later with software. Your camera’s sensor determines how good your images look and how large you can scale them or print them. Image quality depends not only on the size of the sensor, but also on how many millions of pixels (light-sensitive photosites) fit on it, and the size of those pixels. The sensor size also affects what you see through the viewfinder—the relationship between what you’re shooting and what actually gets recorded in the frame and passed through to the memory card. Smaller sensors apply a crop factor to lenses, capturing less of the scene than full-frame sensors do. The full-frame reference point is always traditional 35mm film. Confused yet? Don’t be. Even if you don’t know a CCD from a CMOS from a Four Thirds from an APS-C, this guide breaks down that intimidating alphabet soup and walks you through the sensors you’re likely to encounter. 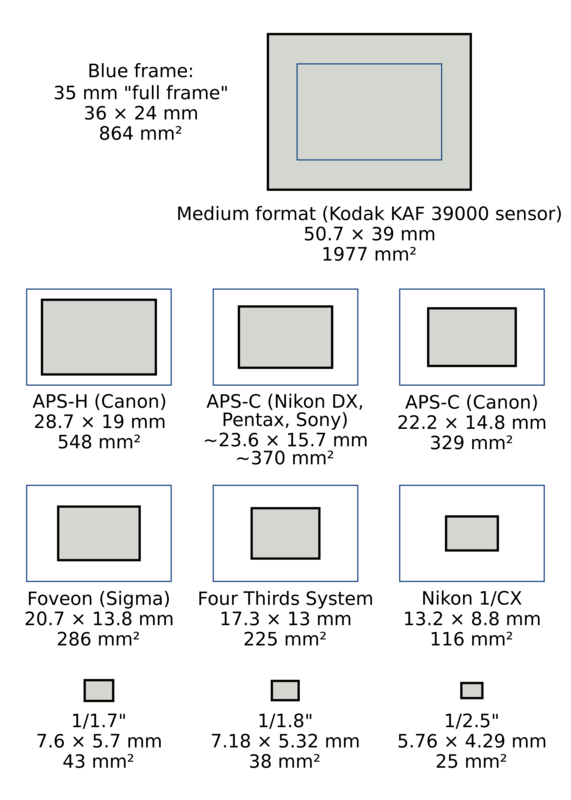 The most common types of sensors are CCD (charged coupled device) and CMOS (complementary metal–oxide–semiconductor). CMOS has been considered an inferior competitor to CCD, but today’s CMOS sensors have been upgraded to match and even transcend the CCD standard. With more built-in functionality than CCDs, CMOS sensors work more efficiently, require less power, and perform better for high-speed burst modes. The newer Foveon X3 sensor, based on CMOS technology, is used only in Sigma’s compact cameras and DSLRs. 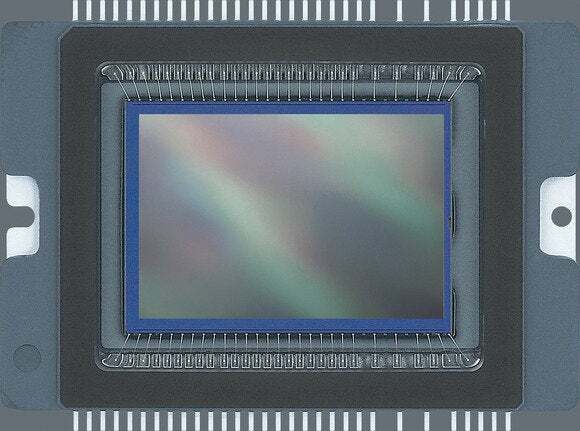 Live MOS is a brand name for image sensors that Leica, Olympus, and Panasonic use in the Four Thirds System DSLRs that they’ve been manufacturing since 2006. These sensors reportedly offer CCD image quality with the lower power consumption of a CMOS. The Nikon D610 has a full-frame sensor. Full frame (36mm by 24mm): The largest sensor size is called full frame, as it is the same as a frame of 35mm film. 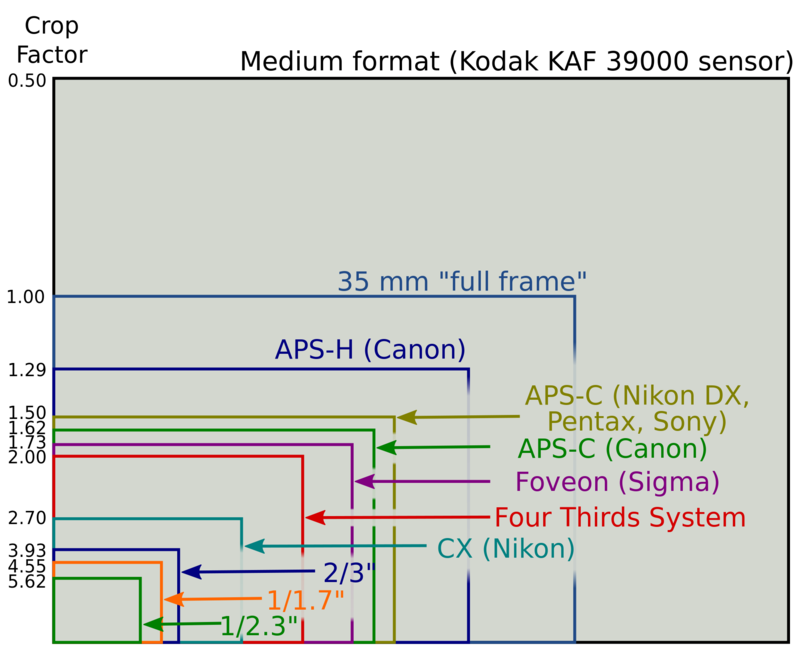 Full-frame sensors are almost twice as big as APS-C sensors. 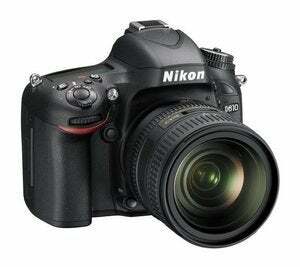 Hefty pro-level beasts such as the Nikon D800, the Canon EOS 5D Mark III, and the Nikon D4 have full-frame sensors. However, over the past year, smaller fixed-lens cameras such as the Sony Cyber-shot RX1 have also featured full-frame sensors. The Sony Alpha SLT-A99, a DSLR-like camera that has a fixed translucent mirror as opposed to one that flips back to capture a shot, is also a full-frame model. With full-frame sensors, you have no crop factor, so what you see through the viewfinder is what you shoot. Larger sensors in full-frame models, when paired with wide aperture lenses, can deliver extremely shallow depth of field—great for macro and video work. Generally, the larger the sensor, the bigger the camera body and the larger the lenses necessary to take advantage of it, though that is starting to change. 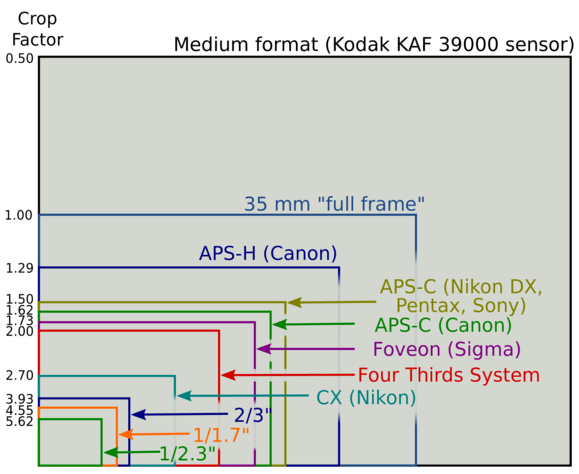 APS-C (23.6mm by 15.8mm): Most major-brand prosumer and enthusiast DSLRs from Canon, Nikon, Pentax, and Sony use an APS-C sensor—but not all APS-C sensors are equal. A Canon APS-C sensor measures 22.2mm by 14.8mm while the Sony, Pentax, Fujifilm, and Nikon (DX) versions range from 23.5mm by 15.6mm to 23.7mm by 15.6mm. The Ricoh GR (23.7mm by 15.7mm), the Canon EOS M (22.3mm by 14.9mm), the Sony NEX line, and Fujifilm cameras all use APS-C sensors. Four Thirds (17.3mm by 13mm): Roughly a quarter of the size of a full-frame sensor, Four Thirds is an open DSLR standard created by Olympus and Kodak and is used in all Olympus and Panasonic Four Thirds and Micro Four Thirds DSLRs. It has a 2x crop factor, which doubles the effective focal length of a mounted lens. 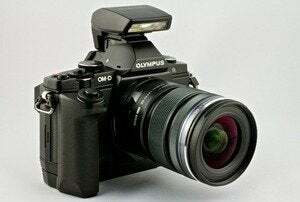 The new Olympus OM-D E-M1, the Olympus Pen E-PL5, and the Panasonic Lumix GH1 use this sensor. CX format (1 inch): Announced in 2011, Nikon’s CX format has been adopted on the Nikon 1 camera system. And in 2012, Sony released the pocket-size Cyber-shot DSC-RX100 digital camera, which uses a 1-inch (13.2mm by 8mm) sensor with a 2.7x crop factor. The last two sizes listed below make no practical sense. As a point of reference, these small-sensor definitions are derived from the size of video camera tubes used in CRT TVs circa the 1950s. 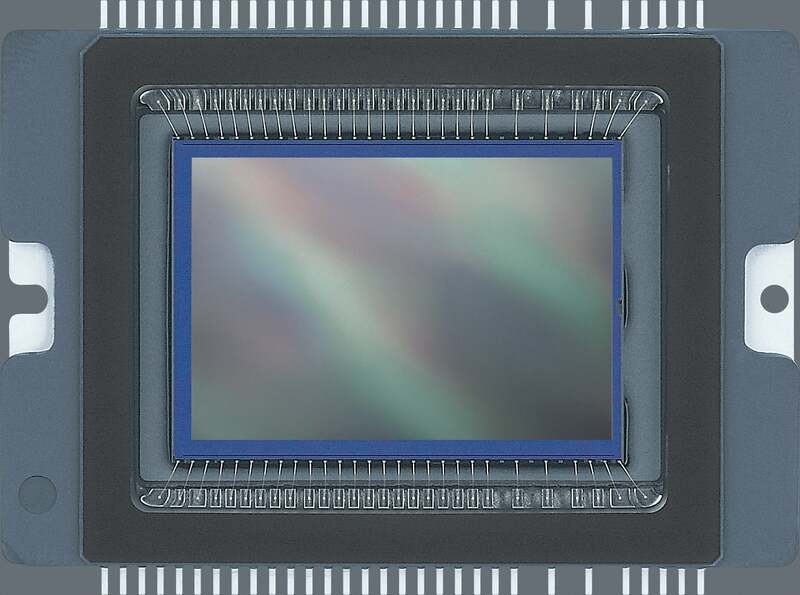 1/1.7 inch (7.6mm by 5.7mm): Among the largest sensor sizes used in compact cameras, these sensors allow larger pixels for improved noise performance over standard pocket point-and-shoots. Larger pixels more ably handle gaps in brightness to reproduce better image detail. 1/2.5 inch (5.76mm by 4.29mm): This size is among the smallest sensors, typically used in low-priced point-and-shoot models. While such tiny sensors are cheaper to manufacture, their smaller pixels crank up image noise and reduce dynamic range, resulting in less-than-superlative images. However, the results still may be better than those from a smartphone camera, especially for portraits of people. Among other variations in this category are 1/3.2, 1/2.3, 2/3, 1/3.2, 1/1.2, and 1/1.8. With sensors as tiny as 1/2.7-inch (5.37mm by 4.04mm), it’s no mystery that smartphones are making serious inroads on compact-camera sales. Compact mirrorless interchangeable-lens cameras typically feature a range of sensor sizes. Smaller ones include the 1/2.3-inch (6.17mm by 4.55mm) sensor in the Pentax Q, and the 1-inch sensor used in the Nikon 1 Series. The Panasonic Lumix GF5, the Olympus Pen series, and the OM-D E-M5 have Micro Four Thirds 4/3-inch (17.3mm by 13mm) sensors. Advanced compact cameras with fixed lenses, such as the Fuji X100S (23.6mm by 15.8mm) and Nikon Coolpix A (23.6mm by 15.7mm), feature an APS-C sensor. The Fujifilm X20 has a 2/3-inch (8.8mm by 6.6mm) sensor while the Canon G1 X has a 1.5-inch sensor (18.7mm by 14mm). Standard point-and-shoot cameras such as the Canon PowerShot SX280 HS and the Samsung Galaxy Camera use 1/2.3-inch sensors (6.17mm by 4.55 mm), while better ones such as the Nikon P7700 have a larger 1/1.7-inch (7.44mm by 5.58 mm) sensor. Smartphones such as the iPhone 5s and the HTC One have a 1/3-inch image sensor (4.8mm by 3.6mm) and fewer pixels. The Nokia Lumia 1020 boasts a 1/1.5-inch, 41-megapixel CMOS sensor. The Sony Xperia Z1 carries a 1/2.3-inch, 20.7-megapixel sensor. The Samsung Galaxy S4 Zoom features a 16-megapixel, 1/2.3-inch sensor. You may have heard of the “megapixel myth,” which states that the more megapixels your camera can pile on its sensor, the better your images will be. This is not true. You don’t just want more pixels, but rather the right number of pixels relative to the size of the sensor. And the right number depends on what you intend to do with your photos. For massive cropping or extra-large printing, additional resolution is useful. For online sharing or conventional printing, resolution is less important. Trade-offs include large file sizes and the need for more processing power to handle high-res photos, versus noise in lower-resolution images. Smaller sensors that cram pixels together tend to have poorer low-light performance and produce noisy artifacts. 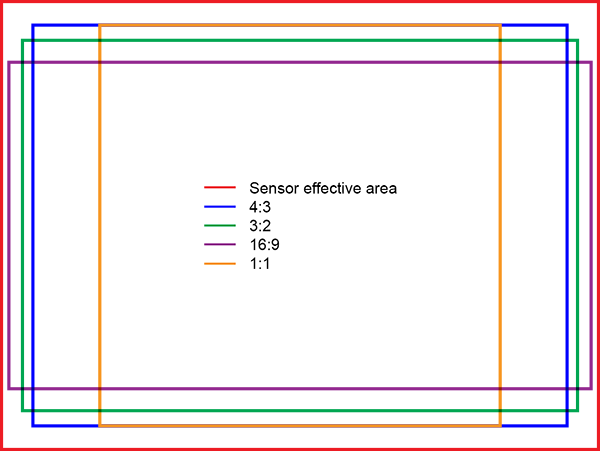 Whenever possible, as you shop for a new camera, pay attention to what kind of sensor it uses. Because the sensor size and type influence such a significant portion of your camera’s output, the sensor is a critical factor in size, resolution, operation, and price. The Panasonic Lumix DMC LX 100 has an effective 12.1mp for photographs but the sensor inside is actually 16.1MP rather than clipping a photograph for different aspect ratios, it utilizes different parts of the sensor to create an actual file of the ratio shot.